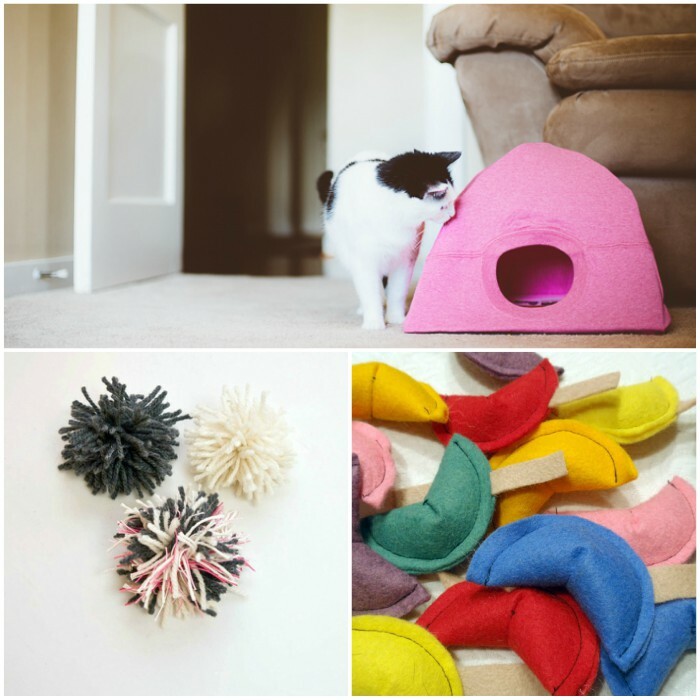 15 Easy DIY Cat Toys You Can Make for Your Kitty TODAY! Our cats are our furry friends… our constant (and sometimes fickle) companions. Who wouldn’t want to spoil their favorite feline with some fun toys or yummy cat treats now and then? After all, for most, pets are like family and you give gifts to family members right? 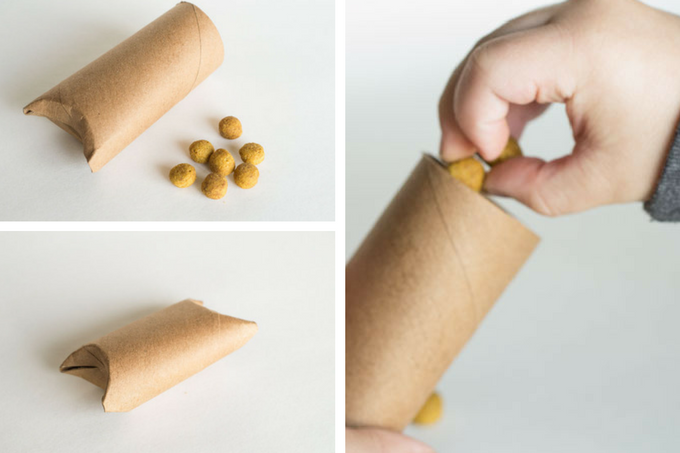 But instead of going to the store or ordering an expensive toy online, you can make some fun and frugal DIY cat toys right at home. And no, you don’t have to be super crafty. 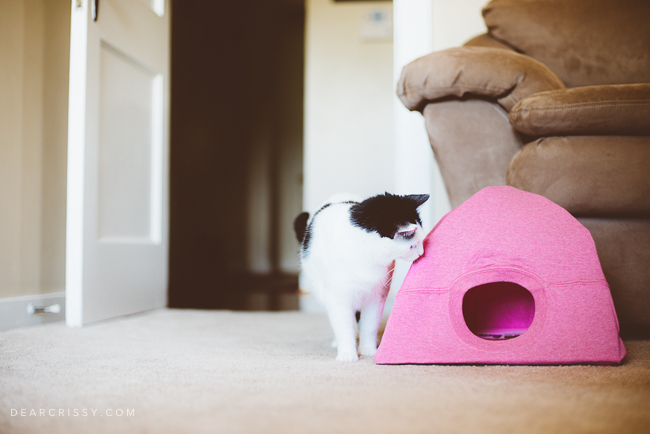 You’ll find lots of easy ideas here that you can do TODAY to have your cat playing in no time. I hope you’re saving your wine corks. 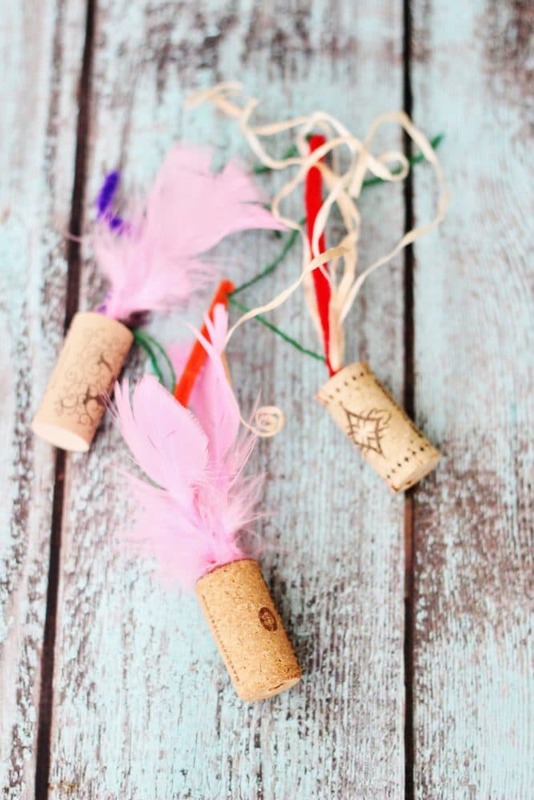 In addition to these fun wine cork crafts, you can make some adorable wine cork cat toys for your furry friend. 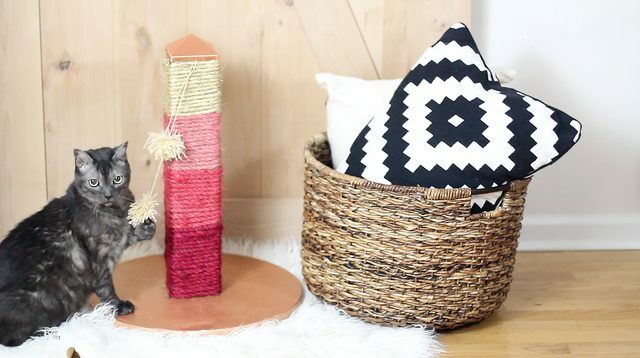 Just insert some feathers, ribbon, jute or anything else that will attract your cat. No cat owner’s home is complete without a scratching post, but have you noticed how ugly some of those things are? Yikes! This ombre scratching post is pretty, pink and will look fabulous in any room. I don’t know about your cat, but our cat, Rosie, will make a toy out of just about anything. 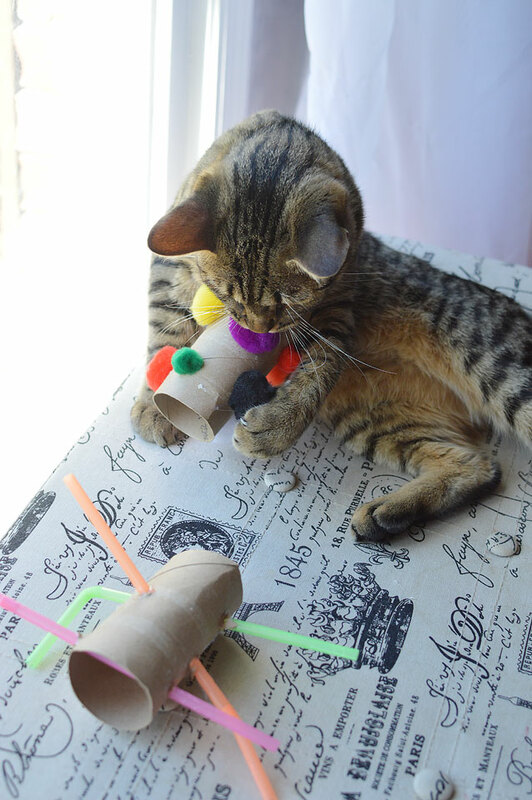 She’d love these cardboard tube cat toys made with pom poms and straws! 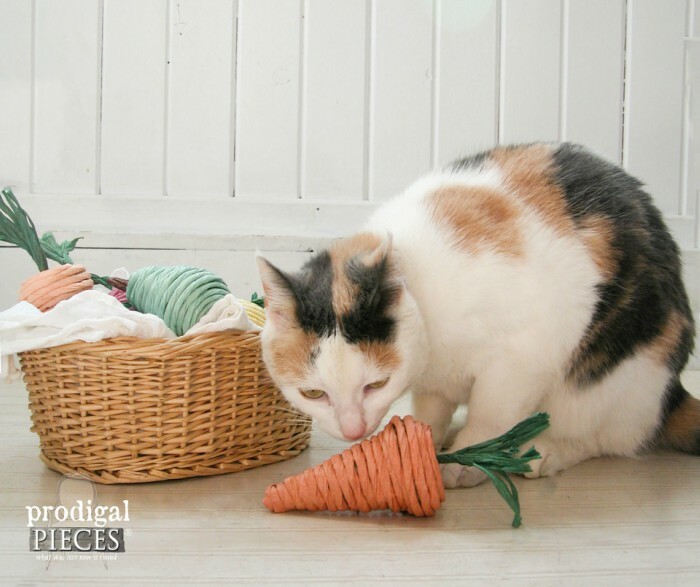 In fact, we recently made her a tp roll cat toy filled with some of her favorite treats. Just make sure you leave one end open enough for the treats to fall out while kitty whacks the toy around. We mistakenly closed off both ends too tightly, and she got a little frustrated! Every cat needs a place to hide — a little sanctuary to get away in when the house becomes too busy. A t-shirt cat tent is just the ticket! Make it with wire clothes hangers (to shape the tent) and an old t-shirt. 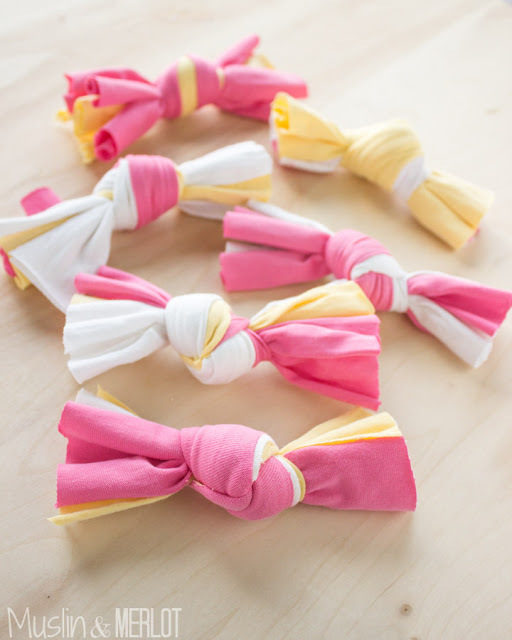 Speaking of old shirts, what cat wouldn’t love smacking these knotted t-shirt cat toys around? It’s a great way to reuse fabric scraps. 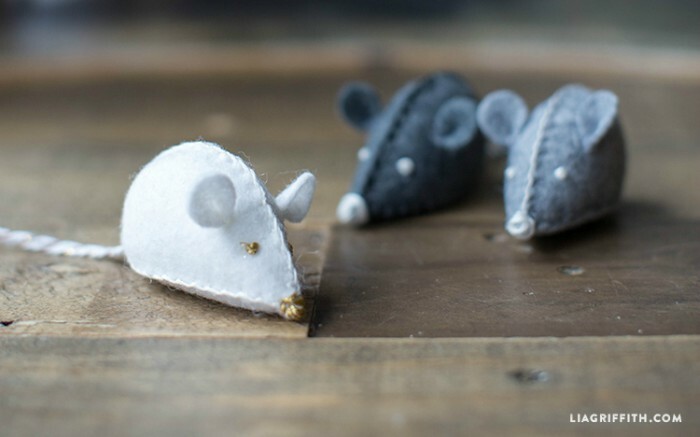 If you’re not afraid of a little sewing, these felt mouse toys are darling. Add some catnip to the stuffing to make your cat go really wild for her new toy. This clever cat owner created papier mache cat toys out of hollow papier mache shapes, catnip, and twisted paper. Make no-sew goldfish toys for your kitty. These are so cute that they’d make great gifts for the cat lady in your life. 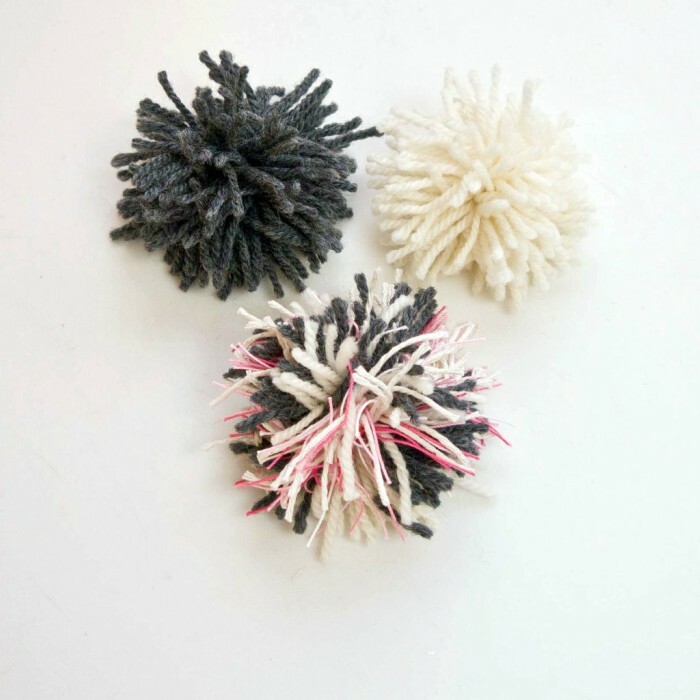 If you know how to make pom poms, you can make one of these pom pom cat wands in a pinch. Your kitty will be thrilled with the chance to leap and pounce on it. 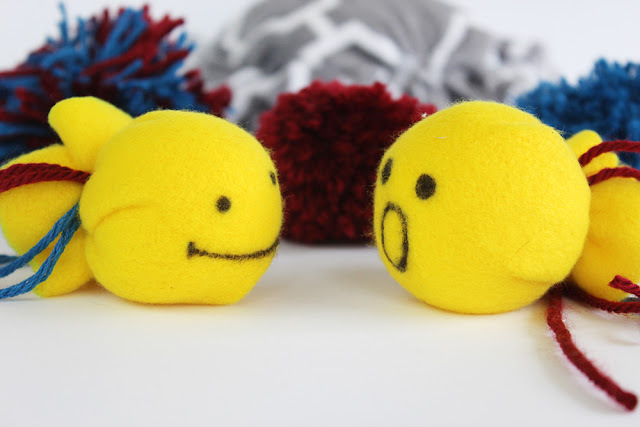 And if you don’t know how to make pom poms, here’s a great tutorial on how to make easy pom pom cat toys for your kitty. 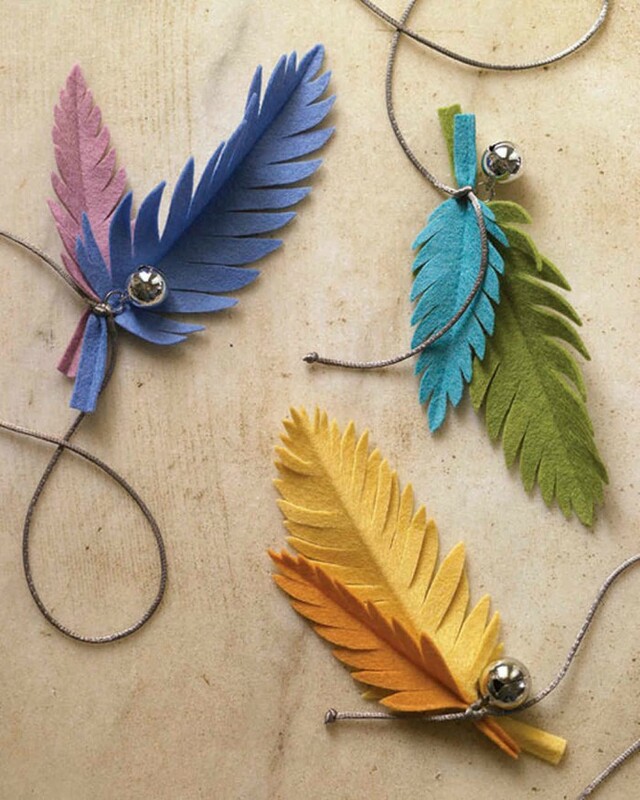 Cut wool felt, add a tinkly bell and a string, and you can have one of these pretty feather cat toys in just minutes. A ribbon cat wand never disappoints. 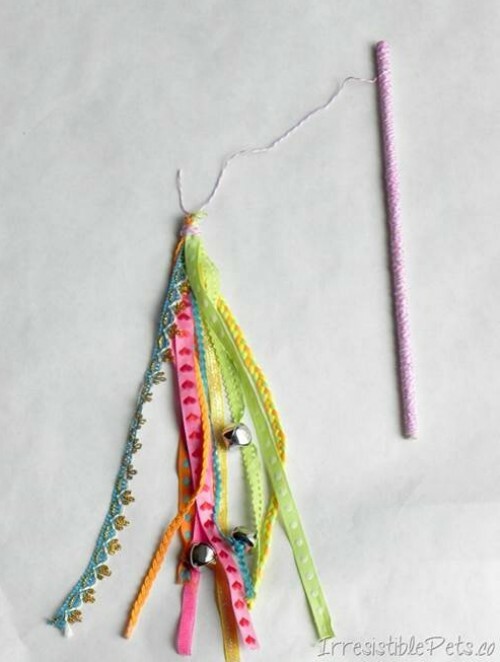 Add some bells for extra noise, and bunch the ribbons by tying them together with some twine. Attach to a stick, and you’re good to go. 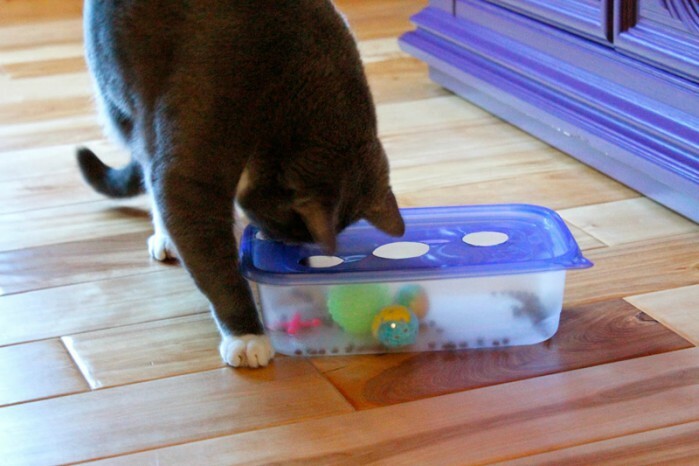 Transform a Tupperware container into a brain exercise for your cat! This DIY cat puzzle will be lots of fun for inquisitive felines. 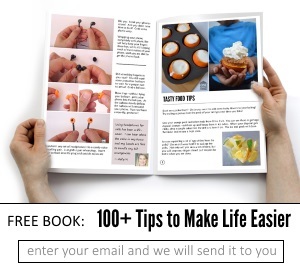 Want to make a gift for every cat you know? 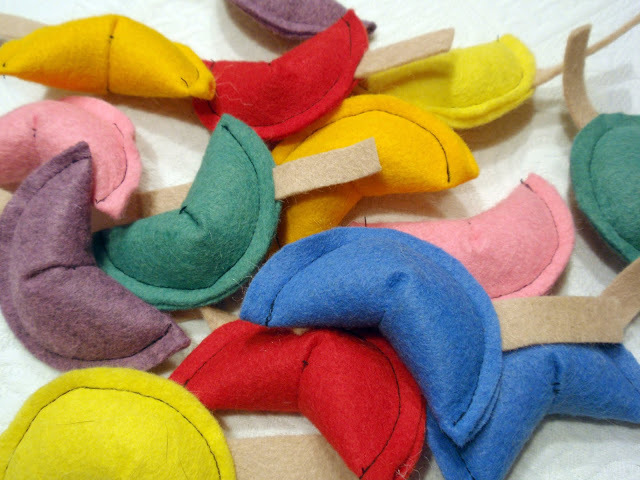 You know you do… Try these fortune cookie cat toys. They make wonderful presents, and people will appreciate that you’ve thought of their cats during the holidays. You could also make a dozen or so to donate to your local shelter. While it might be easier to buy a pre-made toy from the pet store, odds are your cat won’t really play with it much and you’ll be asking yourself why you wasted your money. 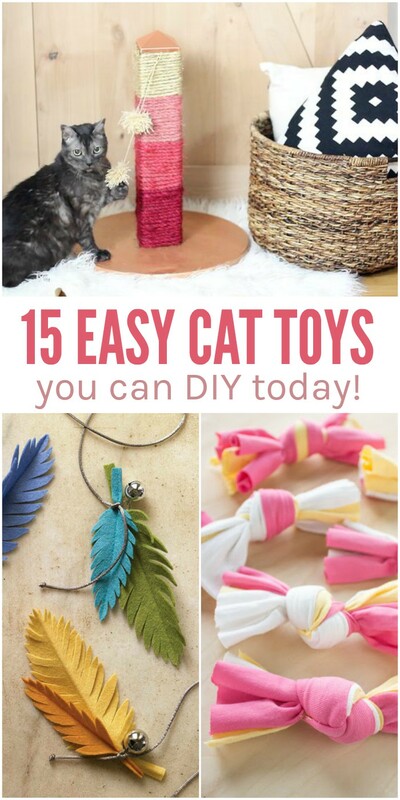 Why not direct that mental energy toward making a toy for your cat with stuff you already have. Then you can customize the toy for your cat’s needs, which is perfect since you know him/her better than any pet store.